My App Center has been ranked among the best online app builder. As mobile apps become a standard in interacting in the digital world, platforms to enable easy app building are becoming important commodities. Apps are becoming essential to the success of every small and medium size businesses to make the brands; My App Center is an excellent ios and Android app builder platform for creating any type of app of your custom business or organizations. My App Center demonstrates excellence in serving customers, a dynamic platform, and overall outstanding customer satisfaction. Join now and build mobile app for your business. Apps have become the must-have tech accessory for many people, and a core part of forward-looking digital marketing plans of your business. Create your APP for any type of business. 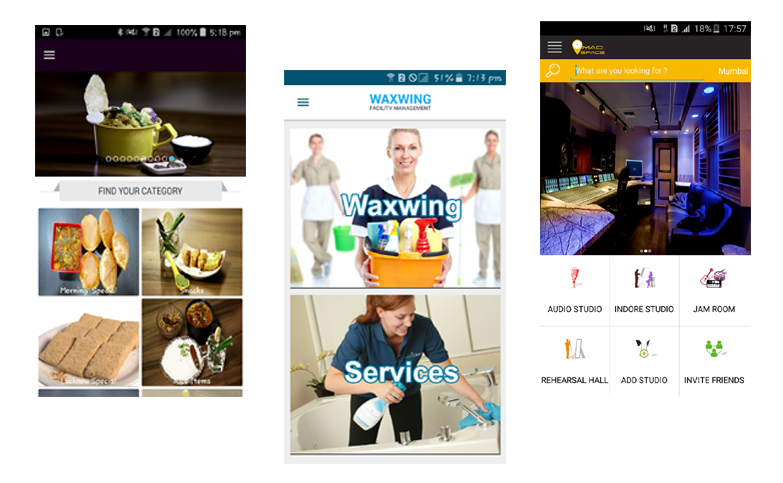 We allow you to create a highly customized android, ios app with easy user friendly control. The only requirement for building an app is to register and fill your information. After you follow the customize app design process and publish your app. You will receive notification to get the app store link as per you chosen app platform. Our platform is built to help you build powerful mobile apps easily. If you have any questions along the way, My App Center Tech Expert Team is here to help you.
" Dear MY APP CENTER Team, You are a very professionally managed company and have lived upto the expectations of customers in terms of quality and time lines. Given an opportunity I Shall recommend you to any and all persons needing a sloution with mobile apps." Vishal Vaid, UNIVERSAL PROJECTS BUILDCON PVT. LTD.
" We wish all the best to Team MY APP CENTER & will highly recommend their services to our Contact circle. " " The work done by MY APP CENTR team on website www.indiatravelite.com is great. and making it Mobile Friendly website. Will be happy to recommend you and your team always to my friends and persons who would like to make mobile apps. " " One of the Most Professionally organised Company and Excellent Customer Service . Extremely capable and they know the Mobile Application very very well . Surely Recommended to all my Clients for Mobile Application . Lets Go Mobile ." " I would like you to thank you from the Bottom of my heart ,with your Support and trust I won National Award for Mutual fund SIP, without Your support and trust it was nearly impossible, And I Promise to Stand with you for your wealth creation and financial goals dreams Come true by any possible way I can. " " I had recommended Yogesh Sahu from MY APP CENTER to Mrs Geeta Neerupam for making a healers’ app for Clove Leaf Academy, Mumbai last year. She was very happy with the services provided by MY APP CENTER Team within the timelines. She further recommended MY APP CENTER to her husband, Shri Sanjay Nirupam for making an app. I will surely recommend him to my other clients, colleagues and friends. " " Yogesh (Founder of My App center) possesses a mix of technology expertise and unwavering integrity to all his clients. Yogesh helped us asses our technology challenges and provided multiple potential solutions only one of which would have required us to use his company. I highly recommend My App center team to develop mobile apps. " My app Center, Authentic app builder is at the forefront of its success storytelling, and the same extends to our mobile app development as well. Hooking walk-in clients who require a mobile app, but for many users app was challenging, we sighted this gap early and created unique strategies which many may have not even imagined. The mobile app was in line with the way customers preferred purchases along with providing them much needed convenience. My app center, iOS and android app builder online has close to 1 lakh mobile app users and caters to over 1000 mobile transactions every week. This early adoption also helped the brand build a reputation of innovation, but it didn’t come easily. It’s a different story today, where My app center, ios and android app creator has successfully rolled out mobile app service that lets it users pay, chat, notify messages, management of data, galleries etc. In a nutshell, My app center mobile app keeps the offline experience alive for its users without compromising on their daily routine! build mobile apps today.